After the curious skip from episode #8 to #10, Madlib finally drops #9, a full fat boom-bap session featuring Detroit's Frank Nitt. As the label says "..."Channel 85,"...is far off most dials. 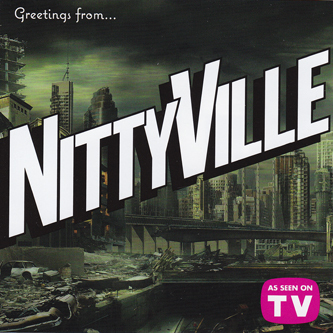 This album's concept TV station runs one show only: the comic-drama, reality-musical called Nittyville, featuring Frank, MED, Oh No, Madlib, and a supporting cast of extras." It's fourteen tracks wide, ten of those are rap tracks and the other four are narrative interlude bridges. We guess Madlib mighta been smoking some new medicinal strains for this one, maybe his glaucoma was playing up? The beats are big, though, and there's some mad artwork from Jeff Jank in the insert. Check it!